• being treated like family. The main benefit of being in the Blue Knights family truly involves the friendship and camaraderie you get from like minded persons. Members from all states and countries are greeted with warm welcomes and offers of food and accommodation when they travel. These non-material benefits are what set apart the Blue Knights from other clubs. We support charity and community service events, and every year we have a few major rides we organise or participate in such as the National Police Memorial Wall to Wall Ride for Remembrance in September and the annual Toy Run in various cities in December each year. We also do social day-rides and weekend rides that are family oriented where non-members, partners and kids can join in (by bike or car). We participate with other clubs' events but we ride as Blue Knights as part of their event. 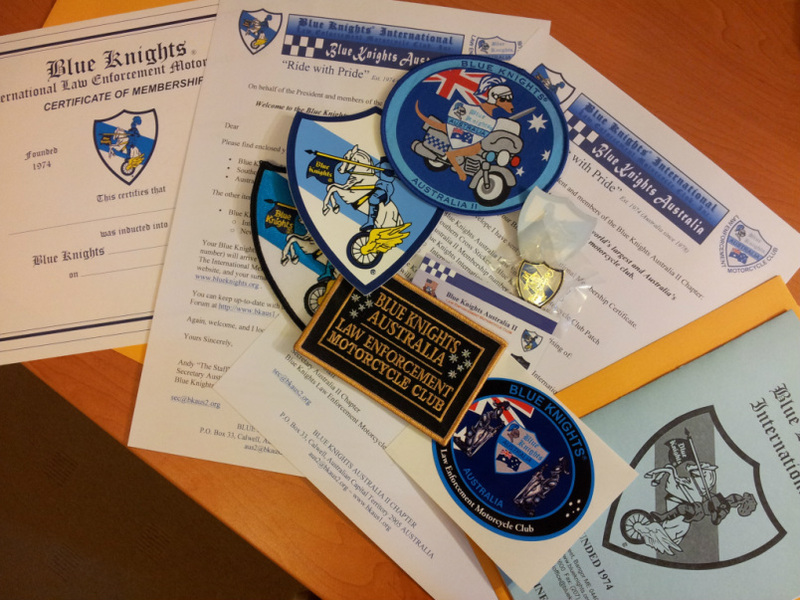 In the membership pack is a Blue Knights International lapel pin, 2 stickers, a membership certificate, plus an International membership card plus chapter specific items. You get access to the national and international forums, and are eligible for a range of discounts at various locations online and around the world, plus a US$3,000 death and dismemberment benefit. More importantly though, the non-material benefits are meeting lots of like minded people who share a common bond of law enforcement and who ride bikes. Not just one brand or type of bike, but all kinds: BMWs, Ducatis, Harley-Davidsons, Hondas, Indians, Kawasakis, Suzukis, Triumphs, Victorys, Yamahas, cruisers, touring, 3 wheelers and sport bikes. You name it, we ride it! Law enforcement camaraderie is far more important than what you choose to ride. There is a wealth of information sharing such as mechanical, electrical, accessories, manufacturer recalls, parts, modifications and clothing. We are also a very fraternal organisation and support each other as a family through financial, material and friendship support, and that carries over into our international organisation. Some of the Australian Blue Knights who have travelled overseas visited fellow members all across the world and never put their hand in their pocket for accommodation, and there was often a bike available to ride. We look forward to welcoming you and your family to our family! To get more info on joining us or to obtain joining forms please email us at aus2@bkaus2.org or fill out the forms below and send to the chapter secretary for consideration. # Please note you must fill out the Application Forms online and then print it out, handwritten Application Forms are not accepted by the International Office.